IndieGoGo Perk: What Can I Get For $25? $25 bucks doesn’t go as far as it used to, that’s for sure. I can’t think of very many awesome things you can get for just $25 – a used pair of shoes? Mediocre delivery pizza? 18 tennis balls? Bleh. Even a night out at the movies for two costs more than that! But if you donate $25 to our IndieGoGo crowdfunding project, you can get something awesome *and* do something good for a local business. How cool is that? Raspberry Beret – Dark Chocolate Cake filled with Fresh Raspberry Sauce, topped with Chocolate Ganache and Raspberry Cream Cheese Frosting. It’s rich, tart, and totally unique. Pirate’s Booty – White Chocolate Chip Cake with a Pretzel Crust and Salted Caramel Buttercream Frosting. A true original and the perfect blend of salty and sweet. Oreo – Chocolate Cake with an Oreo Crust, Creamy Fluffly Filling, and Oreo Whipped Cream Frosting. 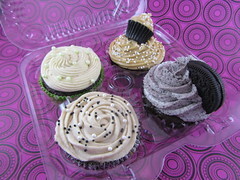 The filling is what sets ours apart – other places may have an Oreo cupcake but nobody does it like us. Banana Cream Pie – Yellow Cake made with Fresh Bananas on a Nilla Wafer Crust, filled with Banana Cream and topped with Whipped Cream. Fresh, perfect for summer, and you can almost tell yourself it’s healthy. 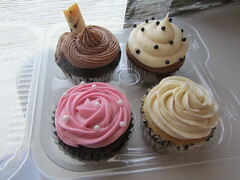 And they’ll be available for pick up at Chocolate Star bakery after August 17th (the day our campaign ends). After you donate, you’ll get an email with all the details and we’ll follow up when they’re ready to go! 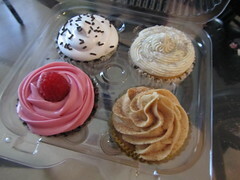 For those who either aren’t local or don’t want cupcakes (does such a person truly exist? 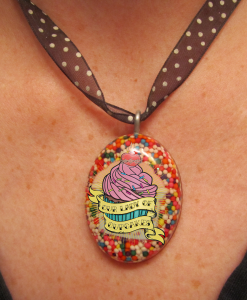 ), we’ve got a cool One-Of-A-Kind prize: a handmade resin necklace with our logo and sprinkles in it. Okay, so that’s a photoshop I made of one because we don’t have one done yet. Hey, we’ve been busy baking! But that really is a necklace that Lisa made from resin and sprinkles – before she was a baker, she was a jewelry-maker. She’s made a ton of cool resin necklaces and even taught a crafty class on it at Evermore Nevermore. They look great and we both get tons of compliments when we wear them because they’re so cute and unique. Plus, they are truly One Of A Kind – because the sprinkles fall a different way every time, no two necklaces will look exactly alike. These will be mailed as we make them along with a handwritten thank you card. 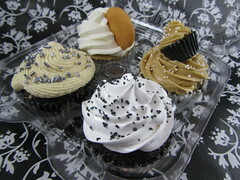 So what sounds better – four of the best cupcakes in town, one of a kind jewelry, or… The Schticky?